Two days before winning Iran's presidential vote earlier this week, reformist-backed cleric Hassan Rohani gave a glimpse of his plans if elected. He was answering questions emailed to him by the Saudi daily Asharq Alawsat. Decisions on major foreign policy issues constitutionally require the support of the supreme leader... If elected, I expect to receive the same support and trust from the supreme leader on initiatives and measures I adopt to advance our foreign policy agenda. Nuclear weapons have no role in Iran’s national security doctrine, and therefore Iran has nothing to conceal. But in order to move towards the resolution of Iran’s nuclear dossier, we need to build both domestic consensus and global convergence and understanding through dialogue… The P5+1 can be one channel for such negotiations, provided that they are prepared to be a vehicle for understanding and resolution of the issue rather than a tool for procrastination and political blackmail. In my view, and in order to find a fair and generally agreed solution, Iran can play a mediatory role between the Syrian government and those in the opposition who strive for democracy and good governance… The year 2014 is very important, as President Assad’s term of office expires. A genuine election, free from foreign intervention and subversion, and the establishment of an elected government could restore stability and security in Syria. If elected, improving and expanding relations with neighboring countries at all levels is a major priority in my future administration. Iran shares borders with fifteen countries over land and sea. All of them are important for us. On your question regarding Saudi Arabia, I plan to reverse the recently exacerbated [and] unfortunate rivalry between the two countries into mutual respect and mutually beneficial arrangements and cooperation to enhance security and restore stability in the region. If elected, I will do my best to secure the release of those who have been incarcerated following the regrettable events of 2009. I know that the constitutional powers of the president in Iran do not extend to the areas outside the realm of the executive branch of the system. However, I am quite optimistic that I can muster the necessary domestic consensus to improve the present situation of Hossein Mousavi and Mehdi Karrubi. 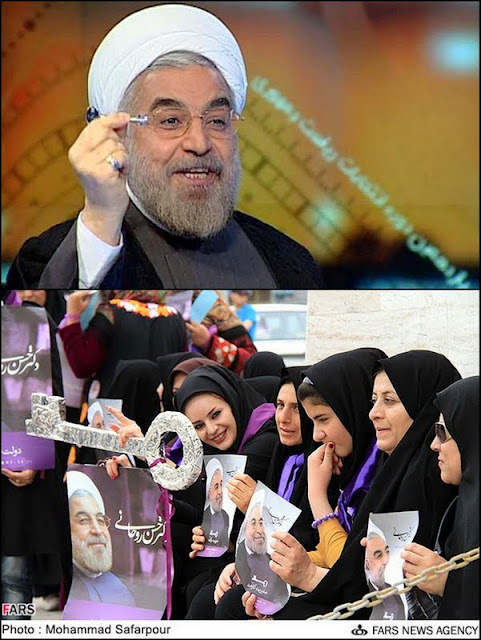 Hassan Rohani did well to have chosen the image of a key to symbolize his presidential campaign. The doors are shut and the horizon is blocked. He perhaps wanted the symbol to rekindle the optimism of the generation of young Iranians who no more suffice with blowing the coals of the Islamic Revolution and denouncing Great Satan. Caution – and lots of it -- is imperative when writing about Iran. The Persian carpet of democracy was diligently woven under the cloak of the Guardian Jurist. The carpet knots are so fine that they block out yarns and threads. Islamic Revolution institutions tolerate differences in detail, not in substance. Suppression of the Green Movement was emphatic. Iran’s spring was nipped in the bud before spring winds uprooted others. Hassan Rohani is a legitimate son of the Iranian revolution. He joined Khomeini as he prepared his homecoming to overthrown the Shah’s regime. He explored the Islamic Republic’s corridors of power in parliament, in councils and in the army, information and national security dossiers. He knitted a strong relationship with Hashemi Rafsanjani and won the confidence of Mohammad Khatami who chose him as his chief nuclear negotiator with the West. Mahmoud Ahmadinejad’s two terms of office were long and taxing. True, they secured Iran “conquests” in Iraq, Syria and Lebanon. Equally true, they ended as they did, with economic sanctions squeezing Iran financially, the national currency falling to record lows, unemployment soaring to new highs, confrontations escalating and isolation mounting. Rohani, as the regime’s scion, is aware the president is not the policy-maker on nuclear and foreign policy matters. The tenet is unambiguous: the key sits in the Guardian Jurist’s drawer. There is no point describing the economic situation. The Internet is replete with figures of losses. Tension with the West is evident. Iran has to pump huge amounts of cash to allow its ally in Damascus to soldier on with the war. The fact Hezbollah joined the fray adds to the political and economic burdens. Iran looks like having rushed into a life-or-death battle, risking all its credit. None of the aforesaid is blown out of proportion. Iran’s isolation is blatant. The Sunni-Shiite rift risks cordoning off Iran with walls and fences. Some believe Iran expanded more than its economy could afford, mirroring the mistake committed by the now-defunct Soviet Union. The triumph at the ballot box of a president with the attributes of rationality, realism and moderation undoubtedly polished the regime’s image, which was badly tarnished by its plunge into the Syria war. Rohani knows this and is aware of what the regime did to Khatami, and to Rafsanjani before him. But the situation today is more intricate and threatening. Iran was never as cut off as it is today. Continuing to tread the current path is fraught with security, political and economic risks. And reneging previous commitments could mean drinking a second poisoned chalice, if not more. He dwelt on hope and new openings, except that the test won’t be long in coming. Can the Iranian president use the key or is he simply the senior employee in the Guardian Jurist’s office? Did the Guardian Jurist admit the regime needs to open a window or will the hardliners quickly remind Rohani doors can’t be opened except with the Guardian Jurist’s key? We have to wait to witness Rohani’s style, the key’s fate and the new demarcation lines between the hardliners and the temple guards. But the dark clouds gathering over the region might not afford Rohani the luxury of a calm search for the key and the opportunity to use his mandate. We could awaken one day to the heat of a major wildfire.